Raza Rumi writes casually but very seriously about Culture, Society, Politics, History and many other topics. He is a great writer. Sadly, I found this article of his very true, and wanted to share here (without his permission). So am just putting the URL. I just happened to buy the album “elements” by Abbas Premji, a virtuoso guitar player from Pakistan today. There’s this one song in it called “seek peace”. I took this picture a while back, and this song, and this picture go hand in hand. The song, is BEAUTIFUL. “Seek peace, wherever you go. Extinguish your desire to avenge” is taken from a Sermon by Hazrat Ali (Karam Allah wajhu). It’s often envisioned that when the sun comes out, a new day starts. Very often it is compared to a new beginning, brand new life, new start etc. But not many people talk about the sunset. Glorified, dignified, the sun leaves the sky and makes way for the moon. The sky changes colours. Orange, golden yellow. And as the light leaves the horizon, traces of black start to seap through. Majestic farewell. Farewell to the king of the day, making way for the prince of the night. The sunset is inspiring, the sunset is amazing, and last but not the least, a treat to watch. 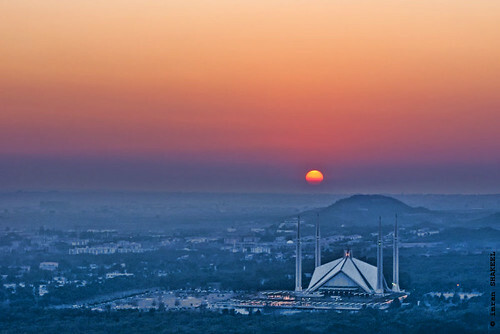 I’ve been to a lot of different places in Pakistan, but the sunset that can be seen in Islamabad, takes my vote. Cloud covered mountains stand witness to it. The trees stand witness to it. And as often as I can, I stand witness to it. One of the reasons I love my college, is because of the view. You can see Saudi Pak tower through the classroom window, and when you go to the roof, you can see the sunset. The sun going behind the under-construction high-rise stock exchange building towards the mountains and in the end it just goes where it has to. Islamabad has a very distinct aura. An aura that I could not find in Lahore or Karachi or Peshawar. Karachi is amazing, it has the sea, the sun setting over the sea is a breathtaking view BUT I might be biased when I say. It’s not AS good as seeing the sunset from the Hiking Track-3, or say when you’re driving on the Margalla road. It’s just not the same. This is my first post, and many of you “might” wonder why I started from a post on sunsets. The sole reason which I also mentioned earlier is that sunsets teach alot. They teach that even though the sun does go down one day. It still rises the other day. If you take that as an analogy, your life may seem to be like a sunset, slowly vanishing, but there’s always a new day. Sunsets are an ode to the fact that life can seem dark, but there’s always a new day. There’s always the hope that a sunset brings to me. A hope that eventhough I won’t see the sun for say, the next ten hours. It will come out. Pinnacle points in a day, the sun rising, and the sun setting. Lots can be written on this, but i’d limit myself here. Life is full of events … tragic … happy … alarming …. monumental …. all sorts of … in different phases and times …! OK … wait a minute … I was about to write some flashback moments here … Let’s have a small quiz first … Can you tell me what is this thing … any idea into its history ???? It’s a small-sized Rocket’s propeller (see the fan like thing on which it is standing) – it had a shell on it with gunpowder – the cylindrical shape also contains gunpowder (to the best of my knowledge) …! A little history of this Rocket now … but first the INCIDENT … It dates back to 10th April 1988 … another day (apart from 8-10-2005) when Islamabad and Rawalpindi were almost shook by rockets and missiles flying in the air … falling here and there … rumors in the air that Islamabad is invaded by India (and even some said Russia) … it was all due to Ojri Camp incident. Ojri Camp was basically army depot with ammunition (I’m not sure … anyone??? I guess it was abandoned by 1988 and people didn’t even knew that it do have LIVE AMMUNITION) … and then something (what?? Ummm I don’t remember … don’t BLAME me … I was just 4 then) happened and taraah … the rumors outside Pindi-Islamabad is all finished … it’s no more … since telephone lines also suffered … few rockets hit the exchange too … ! My father incidentally went to work on (my beloved) Vespa and not on car … so while coming from Pindi to Islamabad at around 11 … (this incident happened between 10-11) … he had 2-3 rockets with him :D as “his collection” … hence a Live Masterpiece no Re-Collection from POF or anywhere … we only painted it golden laters… En route he narrates that there were missiles of lamp post size and man they were real huge … the incident was tragic with lots and lots of stories to tell …! One of our acquaintances had a missile hit their home in satellite town such that it perfectly drilled on wall, ten next room and perfect drilling of wall … such wise it drilled 3 walls perfectly and then hit off 4th wall … that brought all energy game to an end …! I vaguely (READ it CLEARLY … because Even Now I seem to have it in my memory) remember when rockets were really flying off in air, with everyone worried about their kids and men out on work … everyone praying and talking if it is an invasion or Allah’s wrath ..! So it was kind of brief flashback from Islamabad’s life … with this rocket memoir … by the way the other two bigger (and my mom told us that the shell was much beautiful :>) rockets we gave back since the chances of it be LIVE were always there … ! Circulating around is this article by Dr. Shahid Masood printed in today’s Jang. You can read it following this link too ..! there are times when you can’t just take sides … mind says something else and heart tells an altogether different story …! Will we ever learn to follow the mid-path?? the path taught by Islam?? I’m very confused … are you?? Praying that Allah keep us on straight path … and a blessed one. And praying for all those Pakistanis we lost in lal masjid finale on 10th july. I remember, I met a guy an guy few years back, who told me that way before Islamabad existed, in the village of Saidpur, there lived an old man who used to walk past every door in the village and put some oil on the door hinges so that they wouldn’t squeak and disturb the neighbors. I also know about another similar old timer, who was the principal of a federal government school here, and when his own child failed in a class, wrote himself a letter in the capacity of the school principal giving the academic report of the child’s poor performance refusing to promote him to the next class, and then received the letter in the capacity of the father, signed the letter, apologized for negligence, and returned it to the principal.